It's the sixth day of My Life According to Pinterest's "One-derful" Birthday Bash! Today, we're giving away a $75 Gift Card to Gymboree- one of my FAVORITE children's clothing stores! Gymboree has been making kids look absolutely adorable since 1986. Their fashionable, colorful, high quality clothing and accessories help kids to create unique head-to-toe looks that helps them celebrate being kids! Gymboree clothing is available in sizes newborn to 12. Gymboree currently operates 631 stores in the U.S. and Canada. 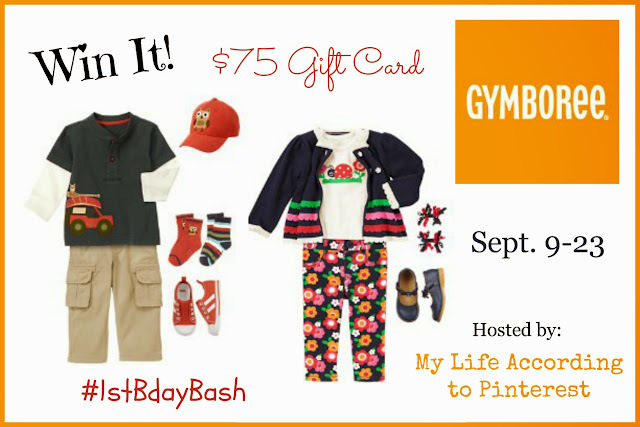 You can check out My Life According to Pinterest's full Gymboree review here. We LOVE Gymboree! The winner will have their prize sent to them by Gymboree. My Life According to Pinterest and other participating bloggers are not responsible for prize shipment.